Deep breaths, deep breaths, deep breaths. Now presssssss!! And just like that, with eyes closed, I clicked myself into a blogging class. I was so ‘fuzzy excited’ I couldn’t wait until my husband came in to the room to share the news with him!! I had actually acted upon something I desired to do and put it into cyber-motion. What’s gotten into me?? Wait, really….WHAT has gotten into me??? What has GOTTEN INTO me??? What has gotten into ME??? Another, more recent example, is my love for painting. My favorite form of therapy is to watch the wet streaks of paint fall from my paintbrush to create a treasure that fossilizes in its dried state. 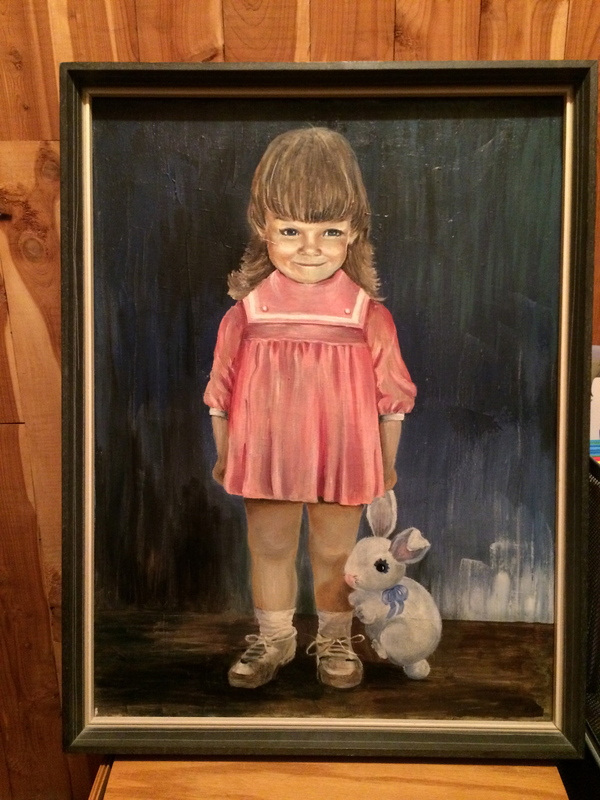 This past Christmas Season I stole the opportunity to visit my ‘paint-brush therapist’ with the goal of creating a child portrait of my now 23 year old daughter. Which, of course, I GIFTED to her. Truth be told, I would have never taken the time to paint had I not planned this as a gift for her. But this ‘blogging thing.’ Hmmmmm. Who am I doing THAT for? Where’s the GIFT in that? Before the hamster wheel of thoughts continued I bravely texted our daughter to share the news with her. her: that’s awesome mom! i’m so proud of you! And there it was. My reason!! I made my daughter proud. After sharing the enrollment news with my husband and receiving the same excited ‘thatta girl‘ endorsement, I’ve settled into the idea of trying ‘this blog thing’ out with a little more intentionality. I’m still not certain why I’ve been led toward this path but I do have faith, hope, and trust that it is my God who inspires me on these creative journeys. He inscribed this creative yearning in my soul and I look forward to discovering the underlying gift that will be found…even if the gift is meant only just for me. Previous He knows your ringtone. Next Unless the heart is knit in love…. You make me proud and jealous!!! Can’t wait to see what God calls you to do. Very proud of you Dawn! The proudest daughter alive!!! I cannot wait to see how your Blog develops…I’m an avid blog reader and already yours has become one of my favorite. Your words inspire me and as always make me tear up when it’s a memory of our loving family. If I didn’t know better I’d think I wrote this. I wish I’d written this. I knew it wasn’t me when I read that you can crochet, I cannot. Oh how I’ve tried but alas, crochet escapes me. Thank you for stopping by to stroll through my site! You are always most welcomed & hugs are always freely given! Perhaps I’ll even create a crochet lesson one day! !😉 Hugs!! !